Oceans and Climate Variability: The ocean covers 70% of the Earth’s surface and, through its exchange of heat, water and compounds with the atmosphere, the lithosphere, and the cryosphere, it plays a key role in our climate system. The ocean also hosts a significant fraction of the Earth’s biosphere, which both responds to, and plays a role in, climate variability. Our scientists study both the role of the ocean in the climate system and the impact of climate change on the ocean. 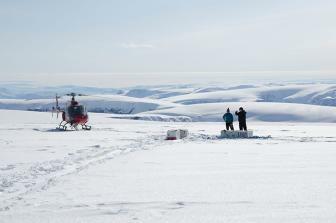 Depending on the area of interest, climate research can be undertaken within existing JP focal areas or as interdisciplinary studies across multiple areas, including the atmosphere and the cryosphere. Climate Impacts: Climate research within the JP also spans the whole globe, from Greenland’s glaciers to tropical Pacific coral atolls, from Bhutan’s old-growth forests to the central Atlantic subtropical gyre, from salt marshes on Cape Cod to the deserts surrounding the Red Sea, from the Kuroshio western boundary current in the North Pacific to the monsoon rains in the Gangetic plain in India, from water resources in the US breadbasket to fragile ecosystems on the Antarctic Peninsula. Research topics within the Joint Program (JP) range from the reconstruction of past climate variability over the Earth’s history to understanding climate variability and change in the instrumental/historic period and in the future, from studies of the dynamics of the physical/chemical climate system to its impacts on the marine and terrestrial environment, such as the sustainability of marine ecosystems, water resources on land, melting of land and sea-ice, and ultimately human civilizations. Please see Areas of Study, Courses, Faculty, and Recent Dissertations and Theses for more information about our program.